A Bunch of Cupcakes with Ghost Rings. Easy Halloween Cupcake Ideas! Our Halloween cupcake decorating ideas were easy and simple as can be. We used ghost ring cupcake toppers. These little rings are cute, easy to use and cheap. All you have to do is bake and frost your cupcakes. Put a cupcake ring on top of each one and you are done. If you want to add any colorful sprinkles or sugars, go ahead. You can find these decorating rings at Ebay and there are different themes so you can use them to decorate cupcakes for a kids birthday party, a Fourth of July celebration, Thanksgiving, Christmas...any holiday at all. 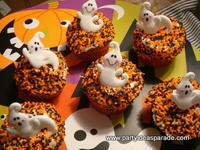 Take a look at our cupcake picture with the ghost rings. They are lots of fun to make and to eat! While you are at the Oriental Trading Company you can also check out the Halloween candy. You can use them as Halloween cupcake decorating ideas along with the rings...find candies shaped like vampire fangs, eyeballs, gummy body parts, skeletons and my favorites, Lizzard Lips. Use the Lizzard Lips with eyeball candies to make some scary and fun cupcakes. Join in and write your own page! It's easy to do. How? Simply click here to return to Halloween Cupcake Ideas.